Osi Umenyiora Thinks RG3 Should Be Called Plain Old "Bob Griffin"
It's not as if it's a cool, performance-dependent nickname either, like the Braided Assassin or Code: Burgandy. 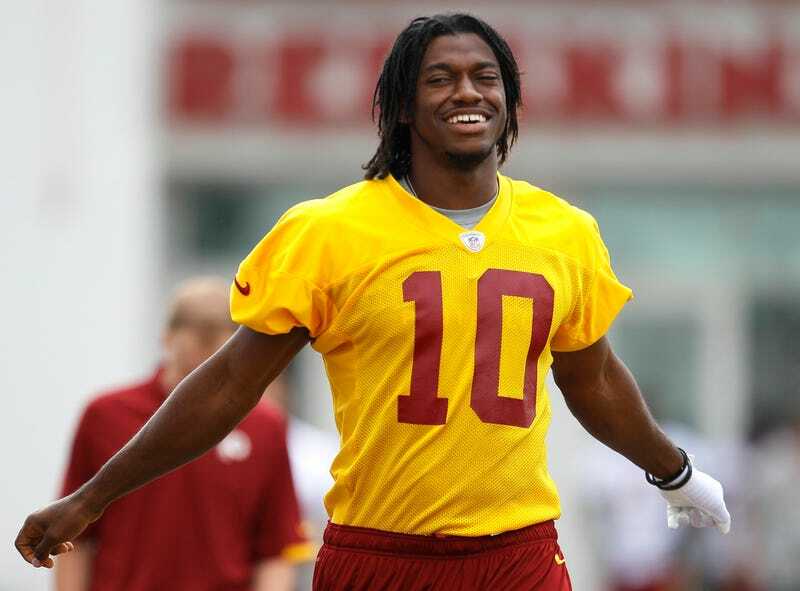 RG3 is RG3 because his actual name is so cumbersome. Not the Robert Griffin part—that's boring, and makes him sound like a white dude from Hingham. It's the "III," that for whatever reason has to be appended every time you use his full name. Maybe this isn't a problem for broadcasters, to slip a "the third" in there, but it's so awkward to break out the Roman numerals in print. And as a grown man, I can only type "RG3" so many times. How about we agree to call him just Robert Griffin? No one's going to get confused. There are no other Robert Griffins in football. (Except the Jets' Robert Griffin, also from Baylor, but whatever.) He can still have his oh-so-marketable nickname, and we get to avoid cluttered up headlines and copy. For his part, Griffin says Umenyiora, and all of us, can call him whatever we want. Code: Burgandy it is!